The Monarch butterfly is the only creature to migrate like a bird. It flies north to south at altitudes of 3,000 feet, dodging aeroplanes and predators. Scientists have been tracking this enigmatic creature and its journey for years; its wintering site in Mexico was only discovered twenty years ago. 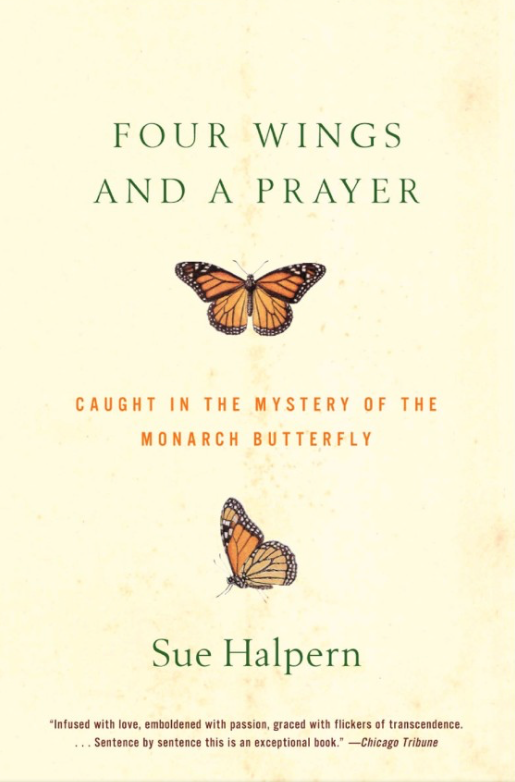 “Four Wings and a Prayer” tells of the quest to trace the Monarch migration, which began in 1952 when two entomologists and 4,000 volunteers tagged hundreds of butterflies. Halpern weaves the stories of these volunteers into her narrative. One, a secretary, gave up her job when a Monarch landed on her desk, and became grand marshall of a butterfly parade. Another lives out of his truck for three months when the butterflies pass through his state in order to follow them. This elegantly written book combines these personal stories with a scientific examination of the Monarch, and its extraordinary journey across a continent.